If there is a great cold atmosphere area to the West of Greenland, it would certainly affect its melt rate. It is so. The sudden ECMWF drop in pressure height over the Canadian Arctic Archipelago by June 9 is the only question over this forecast, come so would result in a surprise large displacement of the coldest zone in the Northern Hemisphere. Note the projected Cyclone over the Arctic Ocean gyre area, this would be the first time in more than a month of such an image. ~EH2r refraction methods likely will surpass supercomputers, with only data from mainly one station at a very strategic location vs hundreds of the world wide grid for the machines. May 9 Accuweather summer projection has little resemblance to EH2r circulation projections. Central Canada should be equal slightly below to normal, at beginning and very end of summer, Eastern Canada above normal till summer end. Baffin Island is way off, must be colder to seasonal throughout. May 18 projection seems to be made from the same super computer run, West of a vortex should have influx from the North, unless the North warms incredibly, it should be cooler there from beginning of summer till end of July. NOAA looks pretty good at equal to average temperatures in the Midwest despite not projecting for each month, the deep Southwest US above normal seems reasonable given the lack of circulation from the greater distance to the Cold Temperature North Pole. 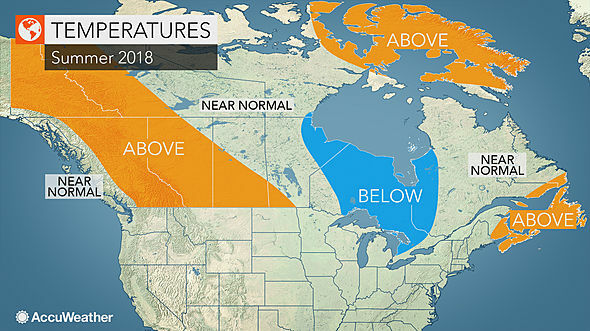 Eastern North America would be an "A" would it be not for end of summer cloudiness cooling. throughout all 4 months. Advection from the South should boost a warming (Eastern North America). The UK becoming progressively warmer than normal as summer progresses looks good. Barents sea area warmer mid summer onwards seems correct, equally Alaska above average temperatures throughout makes sense. Although seems that ECMWF model is calling for El-Nino to reappear as well. ~Where are the thicker layers on sea ice? When sea ice breaks the ice field surface air warms by open water absorbing sun light, T*** top of sea ice mainly covered by snow, becomes T* * partially covered, only then surface temperatures may be much warmer. So far so good, the surface temperature map above does not contradict the equations, except for the missing snow . But while using the same rules, we can find where the most snow lies, for this we need “surface skin temperatures”, which are no longer easily found on the web, but can be taken on IR satellite pictures only when there are no clouds masking the ground. Central CAA ice crystals in May? Very good ice crystal display including Parry Arc, in the bottom foreground ice fog, with a form of organic smog, not common within the last 10 years or so. Sure signals usually associated with a deeply cold Upper Atmosphere. GFS 850 mb Geopotential height and vorticity April 30 onwards. 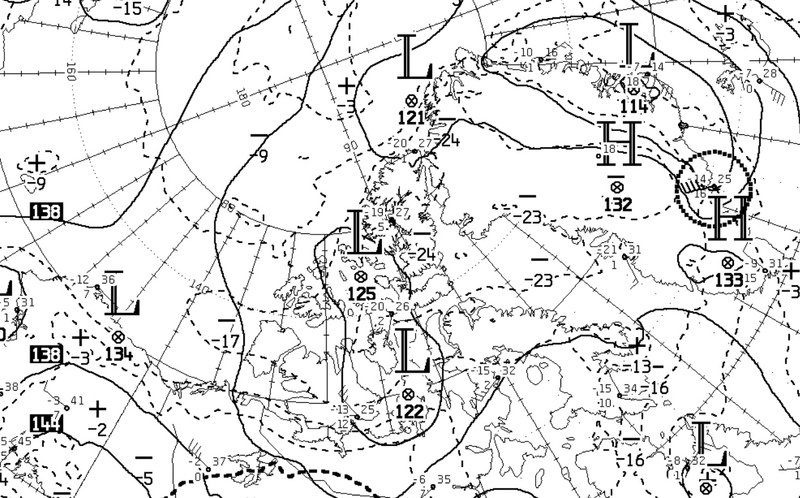 brings a Cyclone right over the Arctic Ocean Gyre area, not possible if there is a major cold temperature "vortice" hovering over the Canadian Arctic Archipelago (CAA), the Low pressures should head Southwards instead. Quite similar to current 2018 prognosis, winter 17-2018 gradually accumulated snow precipitation instead of coming on early like during previous year winter. Just past Arctic winter was not uniform at all everywhere, Bering sea region being warmest throughout winter , just South of CAA being coldest, with a wide region receiving a lot of snow in particular the North Pole to Greenland sector, most of the CAA and likely Barents and Greenland sea zones. 2017 melt season minima was 8th place out of 36 in a crowded field, the next higher 4 rankings were slightly higher in extent. NASA 2017 Gisstemp 3rd place for Northern Hemisphere, 2018 will be between 4th and 6th place. 600 mb air temperature closely represents the Density Weighted Temperature of the entire atmosphere, it is of way better usage than often overused 500mb, because 600 mb height is more at the center of the troposhere. NOAA daily composites are often adequate, sometimes way off, such is the case for 600 mb to the West of Canadian Arctic Archipelago for 2018. 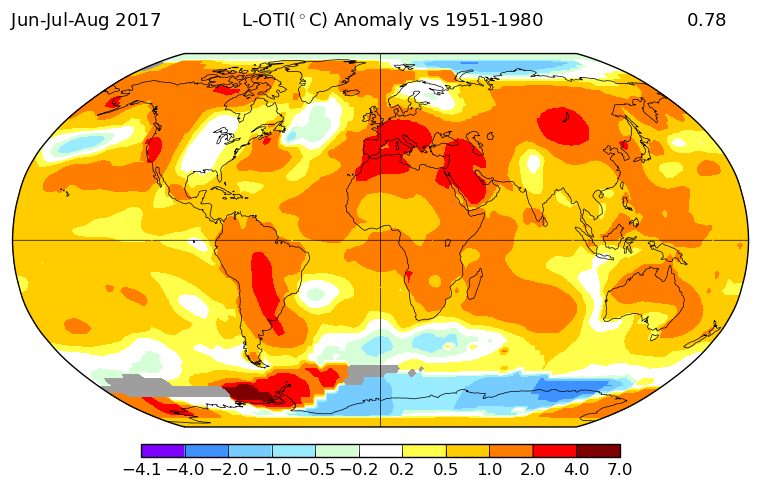 2002 March 25 to April 25 600 mb temperature map is more like what is going on during the same period in 2018. However 2002 over all circulation is from another era, when there was much thicker sea ice spanning a wider area of the Arctic year round, 2002 started just getting away from one of the coldest long lasting La-Nina in history, almost 3 years. 2018 La-Nina from El-Nino 2016 rebound has been struggling , sputtering, has been unstable , weak and predictable as irregular. I have observed definite La-Nina tendencies similar to spring 2008 "Big Blue" eternal cloudy free spring, roughly 47 days long in late winter early spring 2018, with an El-Nino like warm cloud boost over all in 3 months just past. So this summer will sputter at irregular occasions warm and cool, dry and wet likewise world wide. 2002 was much more stable. But this I agree with NOAA daily composites, 2018 has a smaller area of very cold air in the Arctic. Smaller means the jet stream will be closer to the Arctic than tornado alley, but I wont be surprised if tornados will strike and vanish in likewise ENSO mentioned cycles. End of winter stratospheric Polar vortex varies in strength from year to year, 2018 had a smaller less expansive and shorter in duration one than 2011, the latter had upper winds much in excess of 200 knots. Laminal velocities as such don't disappear but dissipate throughout the Upper air, the stronger the upper winds the more there should be tornados. We must keep in mind the distant CTNP cell influencing circulation, the grasp of this circulation extends beyond its sight. 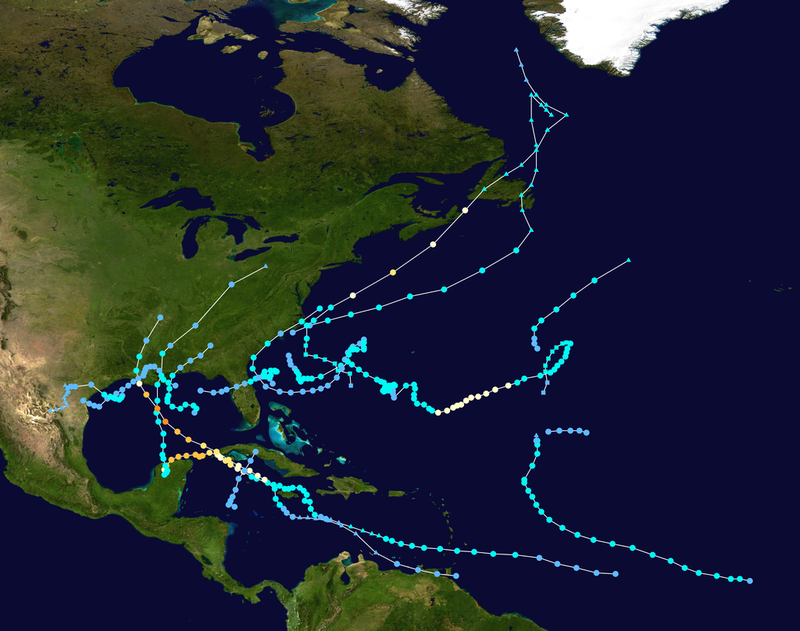 But again 2002 circulation is not quite like 2018, because of mainly one cold vortex left (maintained by Greenland) minus the much warmer Atlantic sea water temperatures, which would mean more numerous fierce hurricanes (than 2002) arcing towards the NE, but for those venturing at Mexicos latitude, further away from the CTNP center of gravity, no real sense of direction, aimless meanderings. 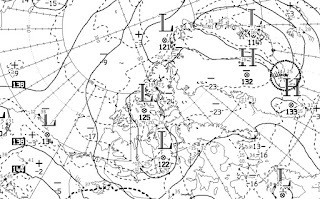 The last CTNP, or what is left of it, will attract cyclones, watch for a one two punch, first a cyclone heading towards Greenland, creating a path or rather an enclosure with a Greenland High stretching South, the following cyclone, if hurricane, will fall into the trap forcing its pathway almost straight North. And so it exactly was. the strong summer cyclonic cloud dominance abridged will mean more sun hitting sea ice, I would expect 2nd place in sea ice extent with a very close to a clear navigation lane across Atlantic to Pacific, an open sea passage near or at the Pole. Difficult as it may be, the lowest volume of sea ice at 2017 Maxima, combined with consistent rapid sea ice displacement velocities and the huge amount of snowfall stemming from the warmest Arctic winter in history, literally makes it easy for a change, #1 least volume of sea ice come September, with a bit of a problem with extent predictability, because sea ice is spread out from continuous daily displacements. The East Siberian sea to North Pole "arm" or ice bridge will figure prominent again, but will be eventually wiped out given the Gyre circulation, made strong last year, was recently reinforced. with a brief cyclonic interlude. The stable presence of an Anticyclone North of Alaska is normal when the Canadian Archipelago atmosphere is coldest, the clouds presence encompassing this anticyclone span is also very normal in spring. Eventually the temperature dew point spread will widen due to solar warming and the effect of a huge area High over the Arctic Ocean will hit like in 2007. I would expect record number of melt Ponds -late- from all that thick snow cover. I expect earliest melt ponds since 2008, they should appear where a lot of snow has fallen, since we only have an educated guess as to where this is, melt ponds should appear in all North Pole quadrants except the Greenland sector. 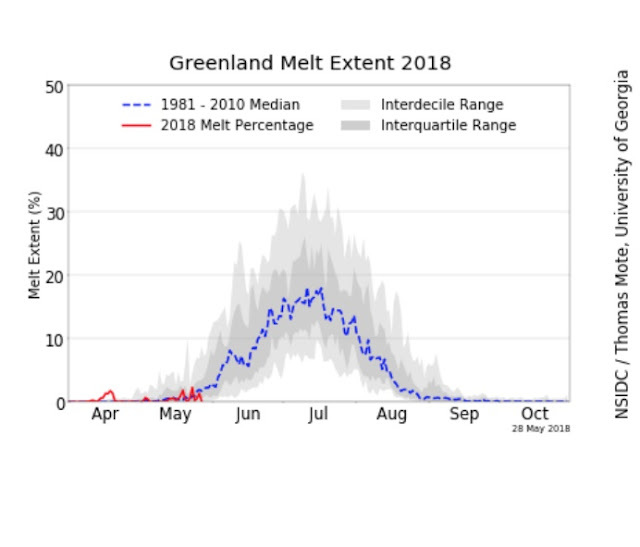 This will accelerate the melt rapidly, numerous melt ponds will signal the start of very rapid melting, after seemingly sluggish melt daily rates interspersed with at times great variations caused by the lack of sea ice consolidation. The North Pole will be partially ice free because pack ice will be moving all over the place. A good Yacht Captain should be able to make to the Pole though. 2018 melting rate will slow mid melting season, it will give the impression of sea ice spared a great disaster again. But the return of the Gyre High in August will compact thinner sea ice pans to the detriment of extent and to the gain of ridging against the Canadian Arctic Archipelago. 2007 projection had pretty good predictions, the Okanagan Canada besieged by record rains, was about to seriously flood at the time 2017 projection was written, until the weather changed hot and dry, floods were averted. NW Europe was very warm as summer NASA map shows, difficult to say about North Africa, but it was equally quite hot. Eastern North America was cool and wet at least till mid summer, 2018 will see a reversal, cool in the West warmer in the East. Then summer end vice versa. We should find out about how much snow has corrupted the sea ice extent data this September after strong Arctic Ocean anticyclone gyre compactions. With nearly same temperature during most of the period preceding and almost identical wind speeds, one day later from April 2 to 3, with time on these pictures from left to right 1 minute apart (April 3 to the right) . We have here a rare combination of required factors to determine if precipitable water (pw) column affects the energy balance at the sea ice horizon. The only difference was pw wetter by 2 mm the evening before, 5.32 vs 3.62 mm. 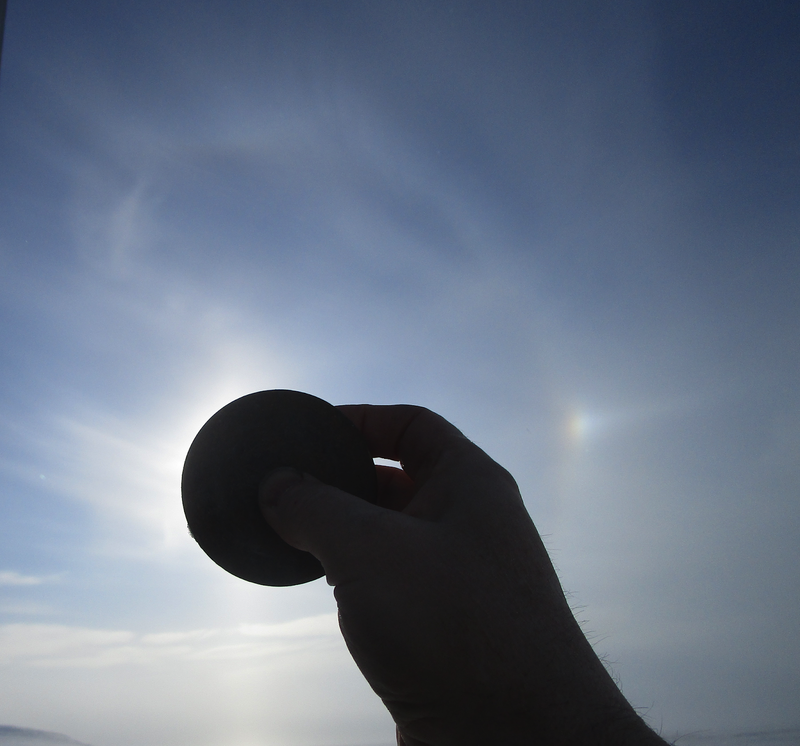 The air was gradually drying up towards a normal Arctic 2 mm, more shortwave was hitting the surface on April 3, the horizon was always lower than preceding day throughout the 3rd as well. Local apparent noon warming was not as strong on the 2nd, therefore rebound of horizon height goes quicker in the evening.